Take a look at the NEW route and NEW Festival location for the 23rd Annual Parade of Lights! 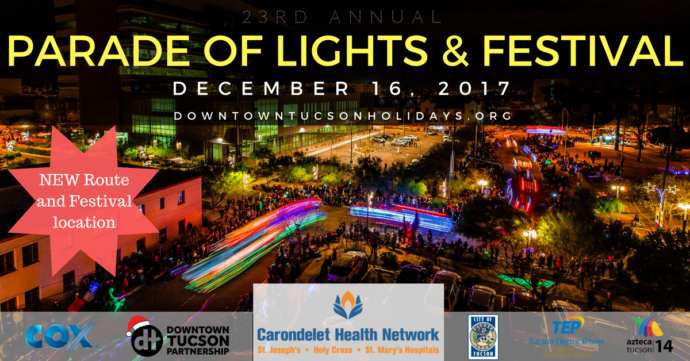 “CARONDELET HEALTH NETWORK AND THE DOWNTOWN TUCSON PARTNERSHIP PRESENT THE 23RD ANNUAL PARADE OF LIGHTS AND FESTIVAL! JOIN US IN THIS TUCSON HOLIDAY TRADITION AS WE WELCOME A NEW ROUTE AND NEW LOCATION OF THE FESTIVAL IN JACOME PLAZA ON SATURDAY, DECEMBER 16TH!!! A beautiful parade! Lots of lights! The Knights of Columbus, proudly led the parade carrying the colors of our country. They also had a float depicting the true light of the world, Jesus, at His birth with His mother Mary in the stable. This was a great parade, many cars and vehicles, marching bands, Big vehicles like fire engines, power company vehicles. The one flaw was the non-stop Spanish speaking announcers. It was too much and annoying. Yes John, it was a terrific parade of over one hour of floats, classic cars, carts, etc. all lit up with bright lights. We wondered about that loud Spanish speaking announcer at Jacome Plaza, near the start of the parade. Would have liked it be bilingual with English too. Otherwise it was a truly impressive parade of lights for the holiday season. Seemed like 25,000 people downtown tonight to attend the festival, see the tree lighting and watch the 23rd annual Parade of Lights. Our favorites were a Gingerbread house, a brightly lit Cemex cement truck, neon lit Tow truck (Tow-maker? ), and the finale of Santa Claus on the very bright fire truck. Also in the parade were Mayor Jonathan Rothschild, Ward 5 Councilman Richard Fimbres and Ward 3 Councilman Paul Durham, and Ward 6 Councilman Steve K on a bike with others. Check out downtown before Christmas to see 38 buildings with new strings of white lights on their exteriors. The snow at Jacome Plaza was a big hit for the kids. Snowing in Jacome Plaza right now compliments of Tucson Downtown Partnership. 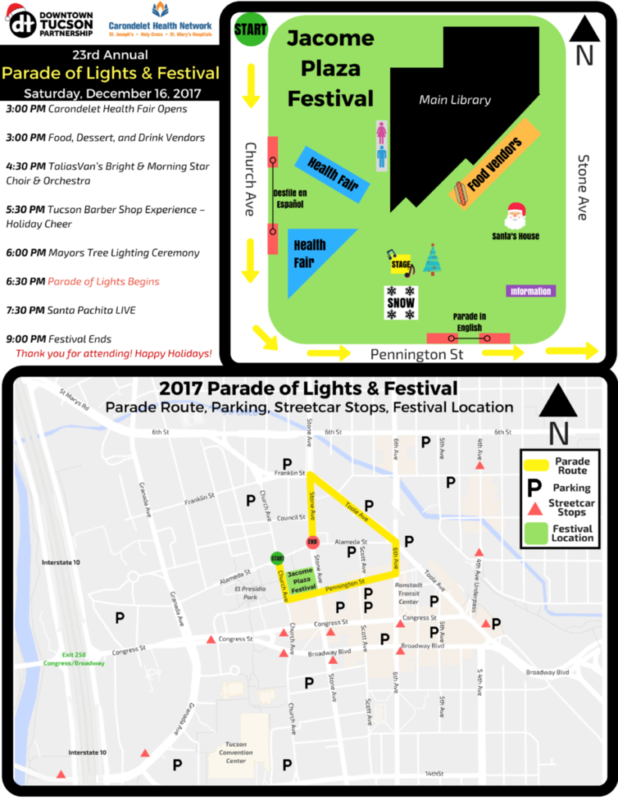 Check it out at 3pm for the festival prior to the parade tonight.